We offer quality aircraft detailing and paint revitalization service for all aircraft. We are an Authorized Applicator of Flight Shield! We are certified with Flight Shield for the aircraft industry to help you Armor your Aircraft. For a free quote on our wide range of professional services just fill out the form and we will get back to you shortly. If you have additional inquiries that cannot be covered under our request a quote page or you would like to speak with the owner directly, please fill out the form here. If would you like to learn more about our services, please contact us today! Our Wet Washing Techniques guarantees that the entire exterior of the aircraft is completely clean. When we are done the aircraft is dry and spot free. 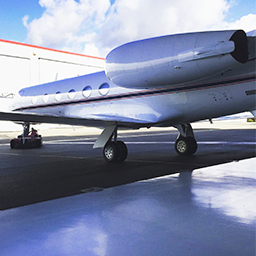 Our Dry Washing is environmentally friendly and completely cleans the entire exterior of the aircraft. Water is not used and this leaves a beautiful shine. This is a very popular technique to stay compliant with most airport environmental restrictions. We utilize a special machine and complete by hand to keep your aircraft looking great and protect your paint. Polishing Bright Work is a specialty we offer to our clients. Few know how to do this correctly but Streamlined Detailing excels at this. We will metal polish the leading edges, engine inlets, thrust reversers and propeller spinners to a mirror finish. Big and small scratches can be removed allowing the aircraft to look new. We have a three step process of stripping, conditioning and sealing pneumatic de-ice boots. This will restore your boots to a high gloss shine that protects them. This will significantly extend the life of the boots and is a very popular service. We thoroughly clean and detail the complete interior. All of the carpeting and upholstery is vacuumed and dry cleaned. Every surface is cleaned, sanitized, detailed and wood and trim are polished. Leather seating and material are cleaned and conditioned. Galleys, Lavs, cockpits, cabin entries and instrument panels are cleaned, sanitized and detailed to perfection! Machine Buffing is a form of polishing and is recommended for paint that is faded or oxidized. For protection we restore and seal the paint, which helps to reduce parasitic drag. After we machine buff the aircraft we hand polish in order to bring the high gloss finish back to the paint. This is a much cheaper alternative to having the aircraft painted and customers rave about the results! or give us a call at (510) 244-8450.